Strata Geosystems (India) Pvt. Ltd.
Mr. Narendra Dalmia has a diversified experience of about 35 years in a wide variety of fields. He graduated as a chemical engineer from IIT- Delhi in the year 1977. He has been involved in fields such as Pesticides, Pharmaceuticals, Textiles, IT & ITES and Civil Construction. He is also an angel investor and has successfully guided several ventures. Currently he is the Director and CEO of Strata Geosystems (India) Pvt Ltd - a Joint Venture with Strata Systems Inc, USA -manufacturing Geogrids (Technical Textiles) and construction of RE Walls. 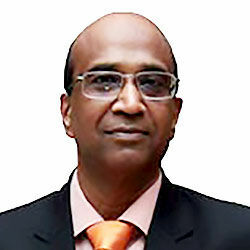 He is responsible for charting out the growth path and expansion strategies along with handling day-to-day operations. TT: How do you foresee the outlook of Geotextiles Industry worldwide in 2012- 2013 with specific emphasis on India? Geotextiles, worldwide, has been well accepted and is progressing at a steady rate. The slow-down in the economy in Europe and USA will certainly hit this sector but on the other hand, countries such as Brazil, South Africa etc. are adopting this technology very well. In India, there are several hurdles faced by this industry and the lack of a concerted effort to promote this stream is forming a major roadblock for it to take-off. Since all applications are related to the civil industry, marketing and understanding is a key factor that has not progressed as expected. Manufacturing is not the major challenge with several experienced players in the industry foraying into this stream. On an overall note, the outlook in India is positive but with caution as technology adoption is yet incomplete and at times rejected. TT: What markets are you currently exploring ? Can you highlight some of the major applications and projects you are currently engaged with in India ? We are currently focusing on the Indian market only given the volume of projects and the effort required. Our major application for geogrids is in the Roads sector used for reinforcing soil in Retaining Soil Walls (RS Walls in Flyovers). We recently finished a record-breaking project on National Highway-8 from Surat to Dahisar (Mumbai) where we finished constructing 16 RS wall structure in a span of 6 months. Apart from this, our projects are located in all corners of the country from Assam to Rajasthan to Karnataka. TT: What according to you are the missing links for India in this field ? Any recommendations for enhancing investment in this sector ? There is a big mismatch between the manufacturing and application of geotextiles in India. A concerted effort is desired in promotion and adoption of the products and technology for several benefits like faster execution, better quality, emergency solutions and saving of critical natural resources. Multi-pronged approach is required at various levels – right from education in engineering and vocational training institutes to defining robust and resourceful design code coupled with construction methodology. Geotextiles need to be evaluated and prescribed in various state and central level tender specifications. More testing labs are required for product as well as application related modeling of its usage. Case studies – for success as well as failures need to be compiled and analyzed in all earnestness for academic evaluations and guidance. TT: Mergers and Acquisitions seems to be the current trend worldwide. What is your view on technology transfer from developed economies to developing economies? Our company is a US based company and started by technology transfer from US. This is the trend observed with most of the other companies in India. Since substantial research has been done in this sector outside India, it would be advisable to first adopt that before developing our own product.